The Social Progress Index is the most comprehensive international benchmarking tool for social and environmental performance of countries. It covers a broad set of measures of social progress, all of which are outcomes or results-based. Indicators are drawn from well respected organizations and have been consistently calculated. While the U.S. has traditionally been a leader, and often a pioneer, in many of these areas, current U.S. performance is weak versus other advanced countries. 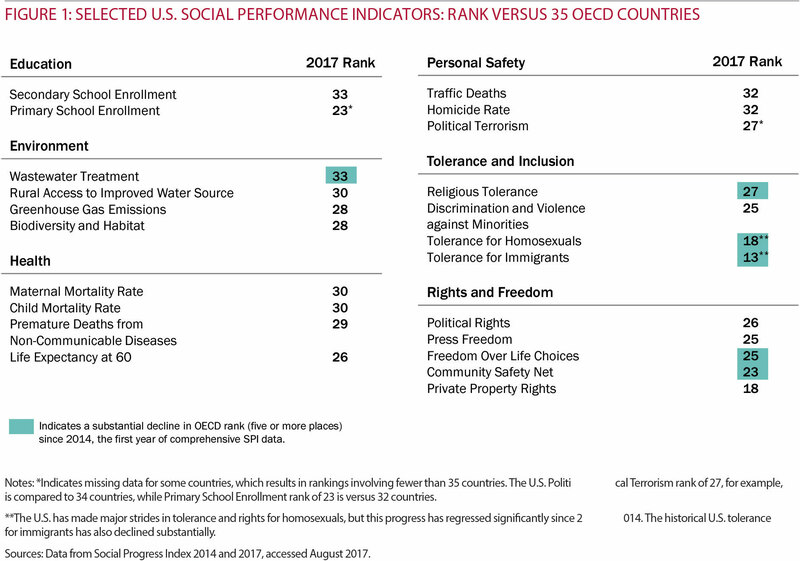 Figure 1 compares U.S. social performance with the other OECD (Organisation for Economic Co-operation and Development) countries, the set of advanced economies on a global basis. The U.S. ranks near the bottom in many areas. Our performance has also declined substantially in a number of areas in recent years, especially in tolerance, inclusion, rights and freedom. Growing inequality and a falling sense of economic opportunity has emerged as perhaps the central challenge of our time. The American Dream, a bedrock of America's uniqueness is under threat. Why is this? The U.S. economy has registered disturbing performance since well before the Great Recession. Since 2011, the U.S. Competitiveness Project at Harvard Business School, co-chaired by Michael E. Porter and Jan W. Rivkin, has studied the root causes and conducted annual surveys of business leaders (HBS alumni) and periodic surveys of the general public. The most recent survey on the strengths and weaknesses is shown in Figure 2 in Part I. As we have noted, both HBS alumni and the general public identified our political system as a major weakness and deteriorating. 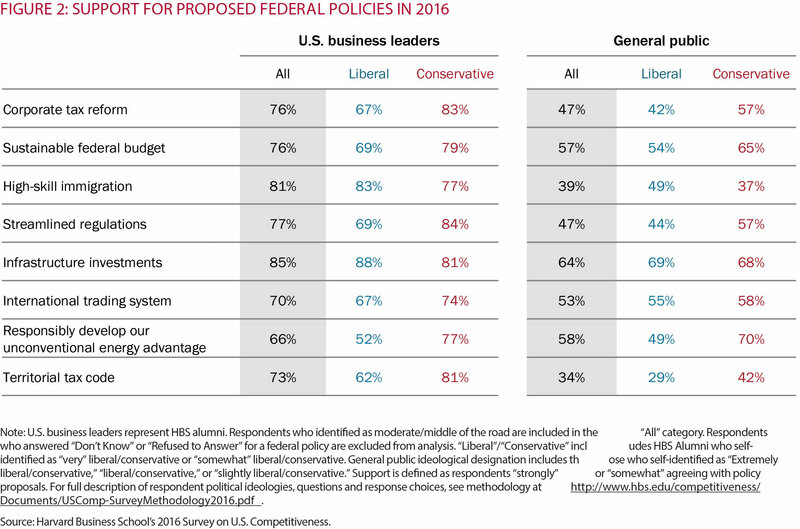 The latest survey (2016) found overwhelming, bipartisan consensus among HBS alumni on seven of the eight points, and majority support for the eighth (see Figure 2).2 Despite a highly partisan and often misleading political dialog around these areas (we discuss how this occurs in Part IV), the general public supported four of the eight areas, and support was close to 50% on two others. Despite wide consensus, however, the stunning reality is that Washington has made zero meaningful progress on any of the eight areas in decades. Project leaders made multiple trips to Washington to meet with senators and members of Congress to discuss the eight-point plan. Legislators from both parties all agreed that the steps were necessary, but cautioned that making progress would be challenging. 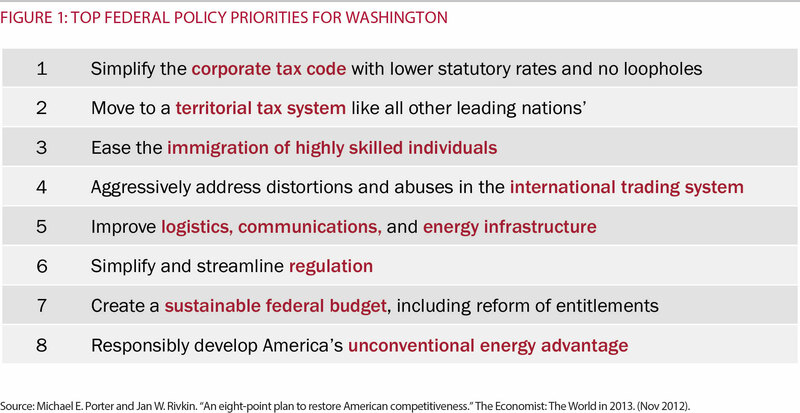 The lack of progress on these eight policy areas reflects a political system incapable of addressing America’s essential economic challenge. This is why business leaders and the general public, in our most recent (2016) survey, identified the U.S. political system as among the nation’s greatest weaknesses. * By a huge margin, business leaders believed that the political system was obstructing U.S. growth and competitiveness versus supporting it. This extreme degree of gridlock is not inevitable in politics, but the result of an American political system misaligned with the public interest. *Healthcare policy was not included in the eight-point plan because in 2012, as in 2017, there was no clear consensus on what needed to be done. *Michael E. Porter, Jan W. Rivkin, and Mihir A. Desai, with Manjari Raman, “Problems Unsolved and A Nation Divided,” September 2016. The report is available on the Harvard Business School’s U.S.
Competitiveness Project website at http://www.hbs.edu/competitiveness. Many indicators help show that politics is failing to meet the needs and expectations of citizens. While no single measure is perfect, and there is debate about how to interpret individual measures, the overall pattern of public dissatisfaction with politics suggests deep concerns with the system. 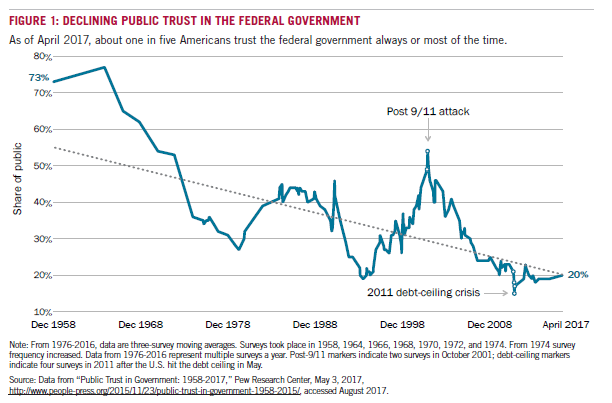 Public trust in the federal government is near an all-time low since at least 1958, with a peak after the 9/11 attacks, but then a resumption of a steady decline, with recent stagnation around 20% (see Figure 1). 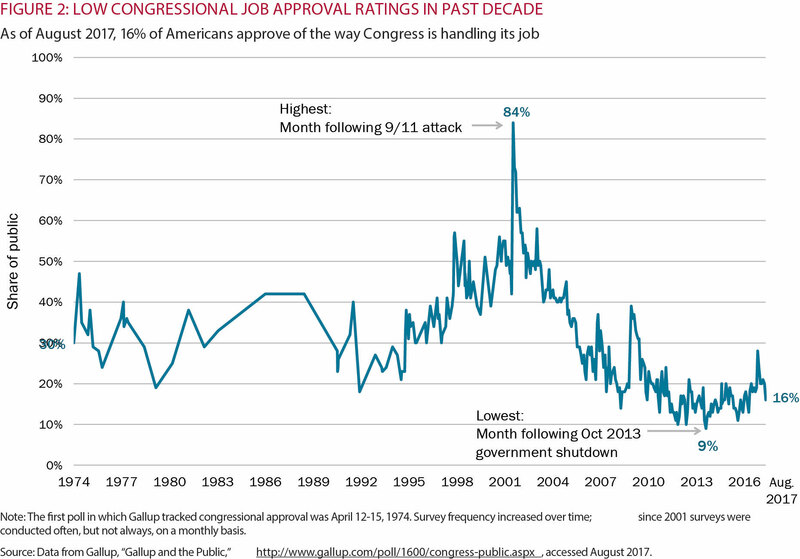 Congressional approval ratings, which have averaged under 20% in every calendar year since 2010, stand at 20% as of August 2017 (see Figure 2). 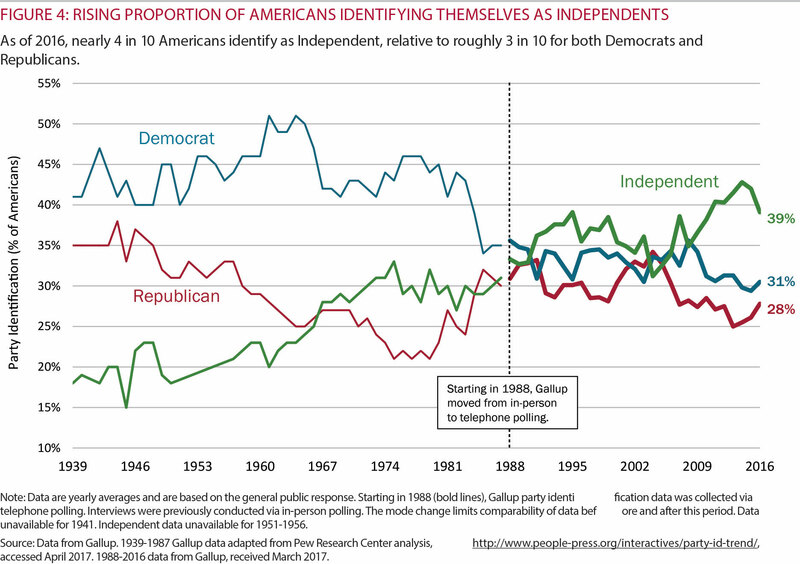 Despite rising partisanship in Congress since 2009, the percentage of Americans who identify themselves as independents has been substantially greater than the percentage who identify themselves with either major party (see Figure 4). 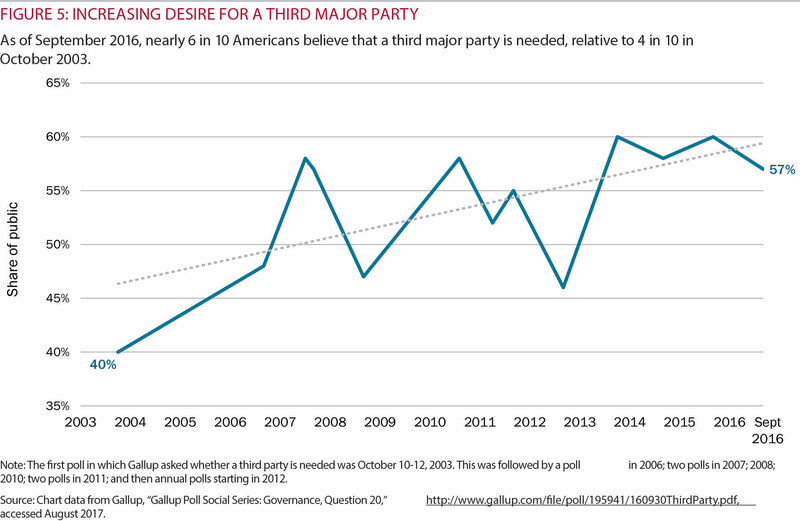 Finally, a clear majority of Americans believe that a third party is necessary (see Figure 5). There are many more signs of dissatisfaction, disillusionment, and frustration with the effectiveness of our political system. All point to the large and growing divergence between what our political system delivers and what citizens actually want and need. In healthy competition, industry actors would be competing to deliver the desired outcomes we just discussed in Part III—and be held accountable for those outcomes. However, as we have seen in earlier sections, today’s political competition fails to deliver the desired outcomes and diverges sharply from the public interest. To understand how and why this is so, we can employ the same tools and concepts used to study countless other fields. The nature of competition in any industry—and the degree to which it is healthy or unhealthy competition—depends on its underlying structure. Industry structure starts with rivals, or the competitors themselves. The rivals have relationships with and to four additional competitive forces: buyers (customers, channels),* suppliers, new entrants, and substitutes. The rivals compete to serve buyers. In many industries, channels are used to reach end customers, such as supermarkets for food. Channels act as an intermediate buyer between rivals and the end customer. To access the inputs they need to compete, rivals depend on suppliers of things like talent, raw materials, and technology. Rivals are also subject to new entrants, or potential new competitors. New entrants come into an industry if they see an opportunity to serve customers better. Finally, every industry also faces the threat of substitutes. Substitutes are different ways of meeting the same customer needs, such as online news versus print newspapers. An industry’s structure is the overall configuration of these five competitive forces and the power relationships between rivals and each of the other forces. ** This web of dynamic relationships determines how an industry competes, the value it delivers to its customers, and who has the power to capture that value. Industry structure explains how rivals or other actors can thrive even while customers are dissatisfied—as is the case in the politics industry. In healthy competition, rivals compete fiercely to better serve customer needs. Channels reinforce this by educating customers and pressuring rivals for better service. Suppliers compete to provide better inputs that allow rivals to improve their products or services. In healthy competition, if rivals fail to serve customers, new entrants come into the industry and compete in new ways, offering better value. Or substitutes shrink the opportunity for rivals—and even replace them altogether—by meeting needs in a new and better way. Healthy competition is win-win. Both rivals and customers do well, and rivals are continually motivated to better meet customer needs. In unhealthy competition, entrenched rivals are dominant, protected from new competition and insulated from pressure by channels or suppliers to improve products and better serve customers. In unhealthy competition, customers lack the clout to pressure rivals to improve. Here, rivals concentrate on the customers who best serve the rivals’ own interests, rather than addressing the needs of all customers. Unhealthy competition is win-lose. Rivals win, but at the expense of customers overall. *There can be multiple levels of buyers. In this industry, there are two levels: end customers (citizens) and channels. **For a more detailed explanation of the concept of industry structure, see Michael E. Porter, Competitive Strategy: Techniques for Analyzing Industries and Competitors (New York: Free Press, 1980). See also Michael E. Porter, “The Five Competitive Forces That Shape Strategy,” Harvard Business Review, January 2008. The five competitive forces in the politics industry are shown in Figure 1, and we will examine each of them and their implications. Before we begin, we note two interesting aspects of the politics industry that distinguish it from other industries. First, competition in politics takes place on two levels: contesting elections and governing. These occur together and reinforce each other. Second, the politics industry has two currencies—votes and money. The nature of competition is manifested in the target customers that rivals choose to serve and who, thus, have the most power to shape outcomes. A political system is supposed to serve the public interest, so all citizens should be its customers. But, in fact, the industry does not aim to serve all customers equally. Just as savvy businesses often choose to prioritize their most profitable customers, the duopoly chooses to prioritize the customers that most advance its interests. Customers in the politics industry can be divided into five major segments based on how they engage with the industry: partisan primary voters, special interests, donors, average voters, and non-voters. The most important customers for the political industrial complex are those who reliably deliver votes or money (or both)—the two currencies that matter in this industry. Three powerful customer groups shape today’s political competition: partisan primary voters, donors, and special interests. They are often overlapping, as shown in Figure 2. The weakest customers are average voters and non-voters. Let’s examine each segment in turn. Partisan primary voters: The first of the three powerful customer groups, partisan primary voters, are the “guardians” at the gate—any candidate must pass by them to get elected. These voters, then, are a key part of the “base” that parties cultivate. Primary voters, as a group, are distinctly different from the average voter. They are more engaged, more partisan, and farther to the left or right within their respective parties. *1 They can also be counted on to turn out in the general election. In gerrymandered congressional districts and even non- gerrymandered districts where one party has a plurality, the partisan primary is the only election that really matters. In 2016, fewer than 10% of U.S. House races and only about 28% of Senate general election races were competitive.2 The rest were in safe seats, and the winner was effectively decided in the primary. Special interests: A second powerful customer group is special interests. 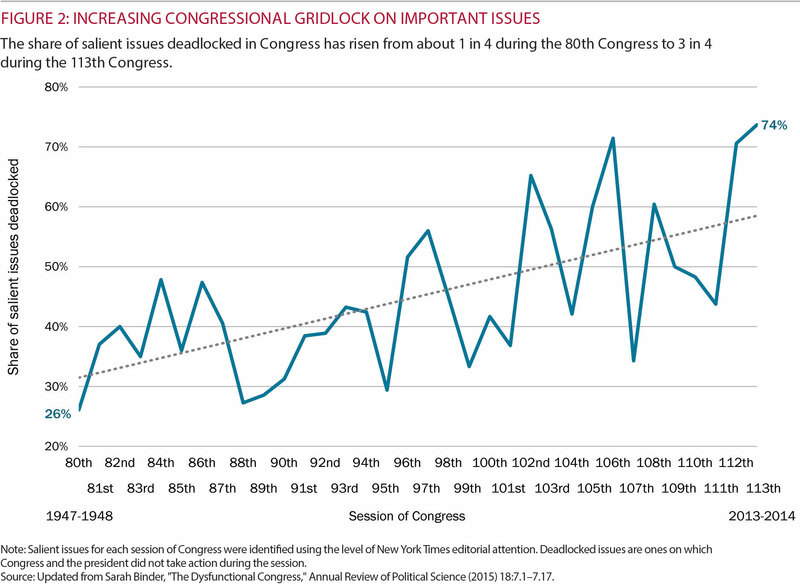 These are organized groups—either policy-related or industry-related—that are heavily focused on influencing political outcomes on particular issues in their favor. Examples of special interests include the pharmaceutical lobby, insurance lobbies, the gun lobby, the pro-choice and pro-life lobbies, small business lobbies, unions, and so on. Special interests are often not interested in compromise on their issues—they want to prevail. President designates who shall serve as the Chair. Party affiliation, then, matters for regulation. Party control of the presidency and the Senate can shape the nature of regulation in particular industries and for particular constituencies. Donors: The third customer group—donors—is powerful because parties seek to maximize the dollars raised. Donors were traditionally wealthy individuals who made direct contributions to candidate campaigns. Since the Supreme Court rulings on campaign finance in Citizens United v. Federal Election Commission and McCutcheon v. Federal Election Commission, however, the distinction between donors and special interests has blurred, as individuals and special interest groups (including corporations) can make unlimited donations not only to Super PACs but also to social welfare organizations, unions, and trade associations.8 All of these groups can use these funds for the purpose of influencing elections and public policies. There is no question that donors continue to enjoy major access to and influence in the duopoly. It’s also true that some donors have, more recently, taken some power from the parties and candidates through the use of the new independent spending organizations. However, the fruits of donor spending still accrue to one side of the duopoly or the other. Hence, the barriers to entry facing new competitors and the ability of the duopoly to keep out new competitors are not substantially diminished. Average voters: The fourth customer group is average voters. Average voters represent a substantial proportion of voters who don’t vote in primaries and are not regular donors. Average voters include voters making up part of each party’s base and swing voters, though they tend to be less ideologically extreme.9 In our current political system, both types of average voters have little power to influence outcomes. In a normal industry, ignoring such a large group of customers would make a competitor vulnerable to new competition. But in the politics industry, as we will discuss, the barriers to entry are very high, and, therefore, new competition does not emerge. The parties, thus, concentrate on delivering value to their powerful partisan primary voters, donors, and special interests, instead of to average voters. Overall, average voters and non-voters represent up to 70% of citizens eligible to vote—the majority.12 Yet elected officials can’t afford to support policy positions based on how popular they are overall with citizens in their districts, or with the public. Instead, they have strong incentives to focus on the opinions of the small set of primary voters who will disproportionately affect their next election, and on the legislative priorities of the donors and special interests who fund them and, in some cases, provide their post-public-service employment. Also, many candidates, and policy solutions that would appeal to less ideological citizens, are driven out by today’s political competition. Thus, more and more average voters drop out. Or—and this may be worse— voters acquiesce and play the game that the duopoly has created of advancing their special interests and making donations. Outcomes only get worse. Overall, then, most of the customers our political system should be designed to serve—citizens—have the least power to influence its results. Until this changes, bad outcomes will persist. Channels are the means by which rivals in an industry reach customers. In healthy competition, channels help customers better understand and access the products and services that meet their needs. At the same time, channels help competitors better serve customers. Independent channels often play a significant role in objectively informing and influencing customer choices, which improves the vitality of competition. When existing channels poorly serve customers, new channels often emerge and can be a disruptive force in shaking up the competition and pressuring rivals to better meet customer needs. Channels in the politics industry are the means by which parties, elected officials, and candidates reach customers with information and persuasion. In the politics industry, there are four major channels: paid advertising, traditional independent media, social media, and direct voter contact. Paid advertising: Created and paid for by candidates, parties, and (increasingly) other outside groups, paid advertising takes place primarily in the media, such as TV, radio, and digital media, to whom the money flows. Paid political advertising is regulated to some extent. This channel is largely controlled by candidates and parties, and hence is not independent. The recently increased ability of independent organizations to advertise in elections creates the opportunity for a truly independent voice. But so far, most of the “independent” organizations are simply other members of the same duopoly. Traditional independent media: The traditional independent media report and offer editorial opinions on candidates, elections, and governing. The independent media include established mainstream organizations—television networks, radio, magazines, and newspapers— but also newer online media such as Real Clear Politics, Ryot, and Vice. Social media: New channels include Twitter and Facebook as well as numerous blogs. Many of these new channels are independent, but the duopoly has aggressively embraced them as well. The new channels have become major low-cost conduits for reaching, informing, lobbying, and soliciting money from voters. This channel has also made possible the proliferation of fake news and news bubbles to a degree not previously possible. *According to a 2006 Pew Research Center survey, of the 22% of age-eligible Americans who were not registered to vote, 33% believed that “voting doesn’t change things,” 43% were “bored by what goes on in D.C.,” and 22% were “angry with government.” For the 23% of Americans who were registered but rarely voted, the corresponding figures were 30%, 42%, and 14%, respectively. According to a 2014 Census Bureau survey, the top reasons why registered voters did not vote in the midterm election were: “too busy” (28%), “not interested” (16%), “illness/disability” (11%), “out of town” (10%), “forgot to vote” (8%), and “disliked candidates/issues” (8%). See Pew Research Group, “Who Votes, Who Doesn’t, and Why,” October 18, 2006, http://www.people- press.org/2006/10/18/who-votes-who-doesnt-and-why/, accessed March 2017; and Scott Clement, “Why don’t Americans vote? We’re ‘too busy,’” Washington Post, July 7, 2015, https://www.washingtonpost.com/news/ the-fix/wp/2015/07/17/why-dont-americans-vote-were-too-busy, accessed March 2017. Why have the traditional channels in politics not been more effective in supporting the public interest? Why have the traditional independent media not held the duopoly accountable for results in terms of solutions, or even presenting the facts accurately? Why have supposedly “disruptive” new independent channels like social media mostly reinforced partisanship and the existing political industrial complex, and done little to shake up competition? The problem is that many channels are not independent, and even those that are—both the new and old—benefit financially by aligning with the duopoly and embracing the partisan competition it has created. Political advertising is often negative and reinforces partisan, zero-sum competition. Since political advertising accounts for an important part of media revenue in election years,15 partisanship has become good for media spending and social media traffic regardless of an organization’s journalistic approach. An independent media should be the loudest voice for the public interest and the hardest for the parties to control. However, partisanship has become too profitable for the media’s business. Viewers and readers are drawn to the bitter fights, to the edgy debates, to who is up and who is down. The 24/7 coverage turns complicated policy into sound bites and efforts at compromise into instant controversy. The 2016 presidential campaign has been compared with a reality TV show, a proven success model for television. The sad thing is that this particular reality TV show really matters for our country. Although there are certainly exceptions to this, the mainstream media have, in many cases, become less of an independent force holding the parties accountable, and more a part of the political industrial complex. Many media have moved away from journalism into opinion shows (which are good for viewership). And importantly, more media have aligned themselves with the duopoly—for example, MSNBC versus Fox. This amplifies partisanship, rather than acting as a force for independent truth-telling that could promote the accountability of parties and elected officials for results. In addition, independents, moderates, and third-party candidates face major challenges in being taken seriously by the media and getting coverage, because such candidates risk attracting fewer viewers, listeners, and readers. Not surprisingly, public trust in the media has declined markedly over the last several decades (see Figure 3). The new Internet and electronic technology should have opened up communication and provided a vehicle for voter education, allowing independents and other non-party candidates to reach voters and donors with potentially less need for party infrastructure. In many other industries, electronic communication and social media have been a tool to provide better service to customers (think flight information updates in the airline industry). In the politics industry, however, new technology and “democratization” of media have so far mostly exacerbated the existing dysfunctional competition. Like partisan television coverage, partisan social media posts get more hits. Also, the political industrial complex has aggressively embraced this new channel, and the duopoly uses social media to bombard citizens with inflammatory and divisive messages aimed at mobilizing angry partisan voters and commentators. Citizens increasingly self-select both duopoly-connected and “independent” electronic media that reinforce their beliefs. Greg Orman, author of A Declaration of Independents, describes this phenomenon as the self-segregation of voters into “partisan cyber ghettos, where they spend their days reinforcing their preexisting political views while demonizing those with whom they disagree.”17 Sadly, then, the net effect of the new electronic and social media seems to have been to reinforce partisanship and division, and purvey questionable and even fake news. Finally, effective direct voter contact and person-to- person campaigning require a substantial and expensive infrastructure maintained by the parties and made available only to their candidates and elected officials. Parties now deluge voters with calls, equip volunteers with technology-enabled walk lists to knock on doors, and carefully target the base in get-out-the-vote efforts. 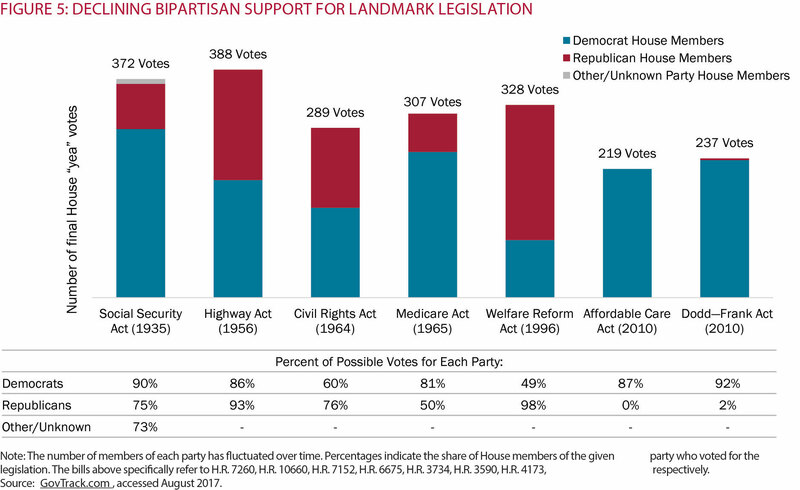 Efforts to reach voters with bipartisan messages are virtually non-existent. Suppliers provide the key inputs that enable industry competition. In most industries, suppliers help improve products and stimulate greater industry efficiency, while often encouraging and supporting new competitors to reduce the clout of incumbent rivals. Suppliers usually make competition better in serving customer needs. In the politics industry, however, most everything necessary to run a modern campaign and govern is tightly connected to—and often controlled by—the duopoly. Suppliers, then, have limited power to shape competition, but face strong pressures to align with one side of the duopoly. In fact, as elections and governing become more complex and partisan, suppliers prosper and their revenues grow. Rather than supporting solutions and finding common ground, suppliers make partisanship worse. In the political industrial complex, there are five key supplier groups: candidates, specialized talent, voter data suppliers, idea suppliers, and lobbyists. Candidates: Most candidates, with the exception of individuals with celebrity status or significant self-funding ability, have little independent clout. They depend heavily on their party for legitimacy, money, infrastructure, a field force, voting lists, debate access, and all the other requirements of a modern campaign. Non-party candidates face major obstacles given the lack of such support. The parties also get to decide which of their candidates to aggressively support, and most often back those who are most tightly aligned with their platforms. 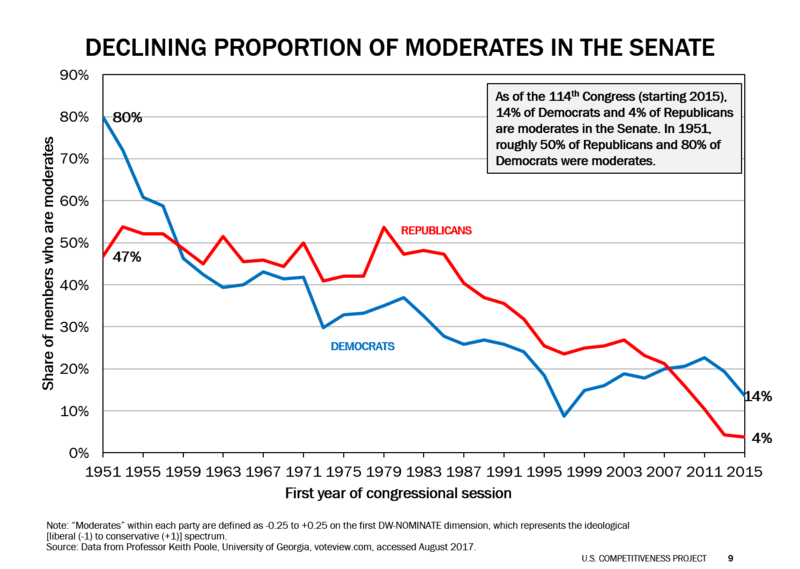 No wonder the number of moderates elected to office has fallen to historic lows. Talent: This includes campaign managers, political consultants, pollsters, public relations staff, data analysts, social media directors, ground staff, and the staff supporting elected officials. The skills for running a modern campaign and governing are highly specialized and getting even more so, but talent works only for one side or the other—it comes with a Democrat or Republican modifier. Independent and third-party candidates face major challenges in hiring the experienced, highly qualified staff increasingly necessary for modern campaigns, because those who work outside the duopoly risk being banished. Voter data organizations: Gathering, maintaining, and analyzing voter data is crucial to modern campaigns, and requires a large and sustained investment. Candidates and elected officials depend heavily on massive voter files to cultivate supporters, raise money, decide on issues to target, turn out the vote, and guide priorities in governing. However, these data are not independently available to just any candidate. Instead, duopoly-linked companies have amassed the best proprietary voter databases and voter lists. These companies decide to whom those data are made available, and at what cost. Party-supported candidates thus reap substantial advantages. Idea suppliers: These are organizations and individuals that develop, pitch, and advocate the policy ideas that get incorporated into party platforms, policies, and legislation. Key idea suppliers are academics and think tanks such as the American Enterprise Institute, the Brookings Institution, the Hoover Institution, and many others. The U.S. has a deep array of such organizations— an estimated 1,835 U.S. think tanks have total budgets in the billions of dollars.18 This has been a benefit historically by creating vigorous competition on ideas and diverse voices. Today, however, many idea suppliers have become more and more aligned with one side of the duopoly or the other. Out of 35 leading U.S. think tanks focused on public policy, about 70% can be identified as partisan or partisan leaning.19 While there are clearly exceptions, Democrats tend to source ideas from the likes of the Economic Policy Institute and Brookings, and Republicans from such organizations as the Hoover Institution and the Heritage Foundation. Many think tanks are far more partisan than these. Some think tanks have developed political action units rather than focus solely on policy analysis. 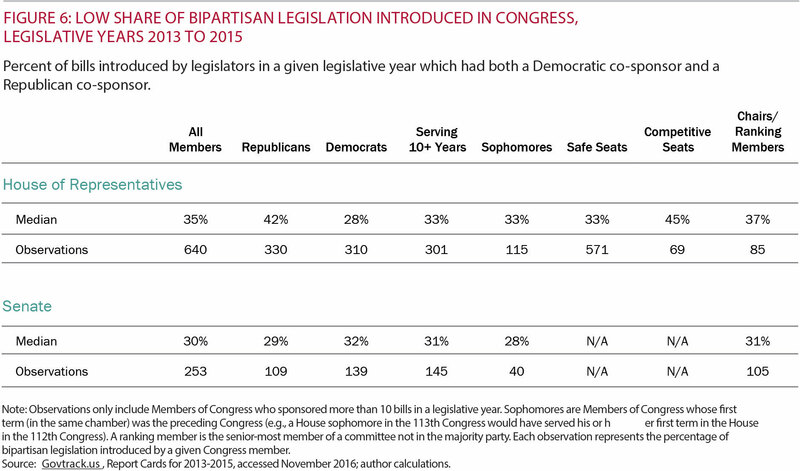 More partisan funders have also reduced incentives for think tanks to develop bipartisan or compromise policy positions. Even some academics, traditional defenders of independence and free speech, have become aligned with the political industrial complex and provide regular partisan political commentary. While we are not saying that partisan leanings of think tanks are inappropriate or unethical, this reality only reinforces the dysfunctional political competition. Numerous studies show that spending on lobbying can produce a high return on investment for the spender (see Appendix D). Lobbying, then, often incentivizes partisanship and works against true solutions. The clout of these “suppliers,” who are often looking out for their own interests and not for the public interest, can present the possibility of distorted legislation and even corruption. Overall, most everything required to run a modern campaign and govern is now tied to the duopoly and has become part of the political industrial complex. Suppliers, then, amplify partisan competition. Industries that fail to serve their customers are ripe for new entrants that improve value for customers and shake up the market. Barriers to entry determine the extent to which new competitors pose a threat, and are an essential part of the structure of every industry. Economies of scale: The national scope of the two major parties allows them to spread the large fixed investments needed in infrastructure, data, specialized skills and other functions across elections nationally, creating major economies of scale. This leaves emerging parties and independents contesting one or a few races at a severe disadvantage. Incumbency advantages in brand recognition, relationships, expertise, and infrastructure: The major parties have universal brand recognition, credibility, talent, resources, and long-term voter relationships. The parties have also built up substantial campaign experience and infrastructure over many years, which are hard for third parties or independents to replicate. Access to key suppliers and channels: As we have discussed, the duopoly now controls much of what is needed to run a modern campaign, which makes it difficult for non-affiliated candidates to run successfully. The duopoly also has preferential access to or control of the channels, which severely disadvantages non-party rivals seeking a voice and voter access. Access to funding: Raising the major funding needed for a new party, or even for an independent candidate, is challenging because the new competitors have limited donor lists and fundraising infrastructure relative to those of the parties. Making matters worse is enormous skepticism that a new party or independent candidates are even viable, which discourages donors. Campaign financing rules are also stacked against independent candidates, such as the rule that allows a donor to contribute $847,500 annually to a national political party, but only $5,400 per election cycle to an independent candidate committee.24 While the relatively recent ability to give unlimited sums to Super PACs could help some non-party candidates amass significant funding, they are still at a disadvantage to party candidates, since the duopoly also has access to the same Super PACs structures, as well as traditional party funding. Election rules and practices: Partisan primaries are the main route to the general election ballot, creating a major barrier to entry that every candidate must overcome. Partisan primaries, gerrymandering, onerous general election ballot access rules for non-major-party candidates, and other rules like the sore loser laws we described earlier, create major disadvantages for third- party candidates, independents, and even moderates within the major parties. Governing rules: Numerous rules, like the ones we described in Part II, give parties substantial control over the governing process. This adds to barriers to entry for third parties and independent candidates, because voters hesitate to support them, fearing (sometimes legitimately) that such candidates will be marginalized in governing. Positioning of new competitors as “spoilers”: The parties also work hard to persuade voters to dismiss third-party candidates and independents, portraying them as “spoilers” who cannot win, but will only split the vote and benefit the “other side.” The parties also ensure that new competitors will also have little influence in governing, and portray them this way. Even capable independents can then be dissuaded from running by such voter skepticism. All these barriers to entry are made even more formidable by the winner-take-all nature of competition in elections. In politics, capturing a non-plurality share of votes leads to a lost election, not to influence or to a position on which to build. Thus, new competitors must surmount the entry barriers and win, not just make a good showing. While some of the barriers to entry facing new competition in politics reflect the inherent nature and cost of modern campaigns and governing, many are purely artificial. They have been created by the parties through the strategic adoption and refinement of a wide array of competitive choices, rules, and practices that preferentially benefit the duopoly. And the parties have often explicitly or implicitly cooperated to create and sustain these artificial entry barriers, which block new competition. With little threat of new competition, better aligning political competition with the public interest is an uphill battle at best. A final potential force for shifting industry competition is substitutes, which offer entirely different ways of competing than those of incumbent competitors. In an industry with entrenched rivals, real competition must often come from substitutes. In many industries where customer needs are poorly met, substitutes emerge and can shake up even dominant competitors. Think, for example, of what happened to large bookstore chains in the face of new online competitors. What are the substitutes to the current two-party system? 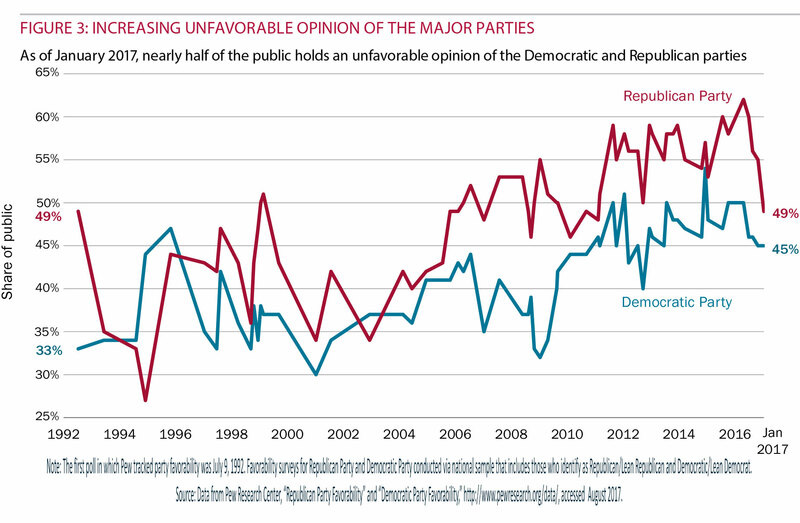 Independents unaffiliated with a party: Independents could be a major force for shifting competition, but they face similar barriers to entry as new parties do. At the federal level, Ross Perot was the last major independent presidential candidate in 1992. In practice, electing independents at any scale will require major dedicated funding pools and shared infrastructure, as we will discuss later. Also, even a totally self-funded independent candidate experiences a strong pull to affiliate with a party to tap into its other resources and advantages. And if elected, independents are incentivized to caucus with one of the parties to gain access to committees and have influence. Organizations that overlay the existing major-party model: Consider No Labels, a bipartisan organization whose goal has been to bring incumbent elected officials together to find common ground and solve problems. While this is a laudable effort that has attracted significant support, delivering solutions through this approach is challenging, given the strong partisan incentives in the current industry structure. A call for bipartisanship—no matter how inspiring—is usually less powerful (when crunch time or reelection or difficult votes come up) than the clout of the parties and the strong competitive incentives to appeal to partisan primary votes and special interests. Allies of No Labels are launching a promising new strategy that addresses some of the root causes of today’s dysfunctional competition (see the discussion of the new approach in Part VI) and this will likely make them a more effective substitute. Self-funded candidates running through the parties: A form of substitute is heavily self-funded candidates who will have greater independence. However, party support remains indispensable in running and governing. The Trump election is a notable example of the benefits of an “outsider” with resources running within the party, instead of as an independent (see more on the election of President Trump on page 36). And even if elected through the parties, moderate or centrist politicians can find that party ties complicate their agendas. All the elements of industry structure we have discussed come together to shape the intensity of industry rivalry and the dimensions on which rivals compete. 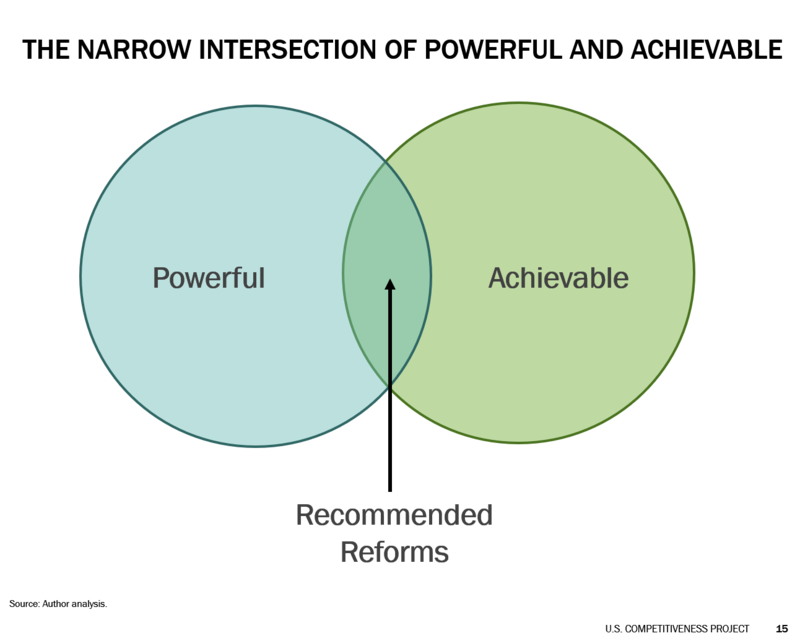 In healthy political competition, industry actors would be competing to deliver the desired outcomes we discussed in Part III. But these are far from the outcomes Americans are getting. Instead, the political system is delivering outcomes that benefit the political industrial complex, but fail to serve the public interest. Why the disconnect? Our political outcomes are not an accident, but the logical result of the industry structure the duopoly has created. They reflect deliberate choices the two parties have made. The root causes of our poor political outcomes start with the fundamental nature of a duopoly—an industry with two dominant competitors. Where competitors in any industry have market power, we know that competition can diverge from customer interests. In a duopoly, this divergence can be substantial. How do duopolies work? In a duopoly, rivalry can appear intense, and that is certainly the case in U.S. politics. But what looks like intense competition to the casual observer is not at all what it appears to be. Rivalry in a duopoly is almost always constrained, because the two rivals recognize that head-to-head competition is mutually destructive. Instead, the two rivals seek to compete in ways that reinforce their differentiation and separation from each other. In a duopoly, rivals also understand that while they compete, they will both benefit from an “attractive” industry as defined from their perspective—one that strengthens and reinforces their way of competing, limits the power of suppliers and customers, and is protected by high barriers to entry. In a duopoly, rivals also depend on each other to take steps to enhance the attractiveness of the entire industry and avoid undermining it. To avoid head-to-head competition and enhance differentiation, the duopoly pursues three key competitive practices: choosing which customers to serve; competing on ideology and advancing partisan interests, not solutions; and avoiding compromise. The fateful and fundamental strategy choice made by the duopoly has been the types of customers they have chosen to prioritize and serve. As we discussed earlier, customers in the politics industry are not all the same; they are segmented. The duopoly has prioritized those attractive customer groups who best serve their interests—partisan primary voters, special interests, and donors, many of whom often overlap. Parties differentiate and separate themselves by dividing up customers based on their ideological and partisan interests. This is how the parties populate their respective “bases.” This puts the parties in sharp contrast, and minimizes target customer overlap and common ground. 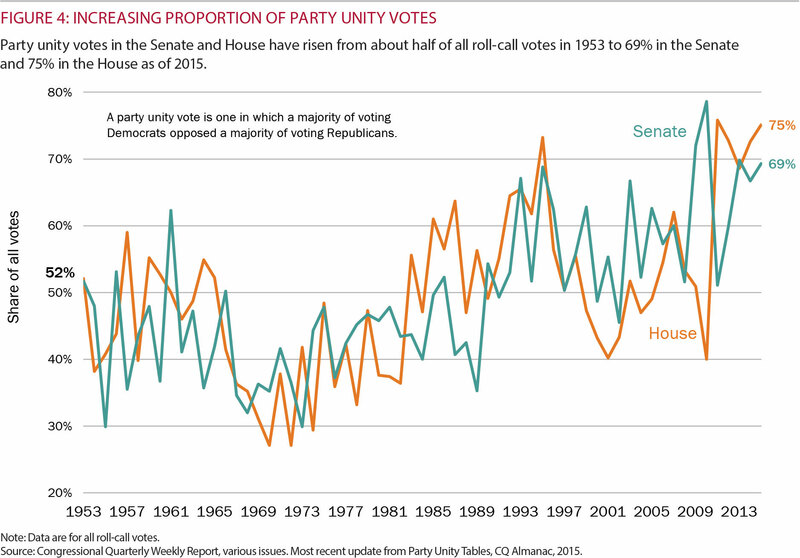 Over time, each party evolves its coalition of partisans and special interests to maintain parity or plurality, as “market conditions” in terms of voter sentiments and interests evolve. The duopoly has been able to divide up and serve customers this way because of the absence of new competitors that compete in a different way. This allows self-serving competition that fails to advance the public interest to persist. Party platforms, tools with which parties collect and cement their allegiances with their target voters, are similarly often incoherent or inconsistent. This is because they are heavily based on ideology or appealing to partisan interests, as we will discuss further. The parties separate voters to reduce accountability. They choose to compete on partisanship and division, rather than by appealing to many or to the middle. They fail to forge the broad-based consensus that we want our political system to achieve, as we discussed in Part III. Competing on division reinforces the parties’ differentiation from each other while enhancing their core customer loyalty. The parties have little interest in targeting the middle, or customer groups with overlapping interests, because this would blur their differentiation. This would also create more pressure to actually deliver real solutions to voters. This fundamental competitive dynamic in a duopoly is what some political theorists have misunderstood in predicting that the parties would move to the middle. Parties compete to create and reinforce partisan divisions, not deliver the practical solutions that are the most important outcome we need our political system to achieve, as we discussed in Part III. The duopoly appeals to its partisan supporters based on ideology, not policies that work. Ideology offers simplistic and polarized approaches to addressing issues. The definition of ideology includes words such as “beliefs,” “perspectives,” and “doctrine,” not words like “reality,” “objective analysis,” and “facts.” Ideological stances appeal to partisan believers but rarely, if ever, provide an actual solution. Ideology almost always oversimplifies issues, and ignores the multiple dimensions and complexity of most solutions. Low taxes, for example, is an ideological perspective but not a guide to actual tax policy, which must incorporate the reality of the nation’s (or a state’s) fiscal situation and must recognize the many ways in which it affects citizens differently. The same can be said for small government, reducing income inequality, and many other issues that are part of today’s political debate. Today’s partisan and ideological competition presents voters with numerous false choices that frame issues as “either/or”—for example, big government versus small government, cutting taxes versus raising taxes, free trade versus protectionism, supporting lower-income citizens versus supporting higher-income citizens, regulation versus deregulation, and protecting the environment versus protecting business from environmental regulation, to name just a few. Given that most issues are complicated, nuanced, and involve multiple valid viewpoints, the parties seek to confuse and mislead voters on the facts and what they should want. The duopoly works to make issues simple and divisive through careful selection of “facts,” which are often incomplete and misleading if not completely incorrect. This allows the sides to make voters think that ideology is relevant. On trade, for example, Democrats have tended to describe it as negative—a job killer— despite a large body of evidence that on balance open trade improves the standard of living for all levels of income, and also creates economic growth and jobs. Republicans attack mandates to buy health insurance as usurping individual liberties, whereas insurance mandates are a feature in many industries (such as car insurance) and a fair and just policy to avoid free-riding by some citizens who avoid paying their share of costs and who inflict costs on other citizens. Finally, given the failure of ideology to deliver solutions, it is no surprise that today’s political competition favors talk over action, and relies on making unrealistic promises that are rarely, if ever, fulfilled. Action and progress are critical outcomes that we want our political system to achieve, but, as we discussed in Part III, this is not what our political competition is now designed to achieve. not just cater to the dominant interests and ideological perspectives of the day. Today’s political competition violates this fundamental principle. Despite the essential role of compromise in finding true solutions and making progress on the issues, today’s political competition treats compromise as failure. It is no surprise that bipartisanship, finding common ground, and compromise—fundamental principles of good political outcomes—have become anathema to the duopoly. 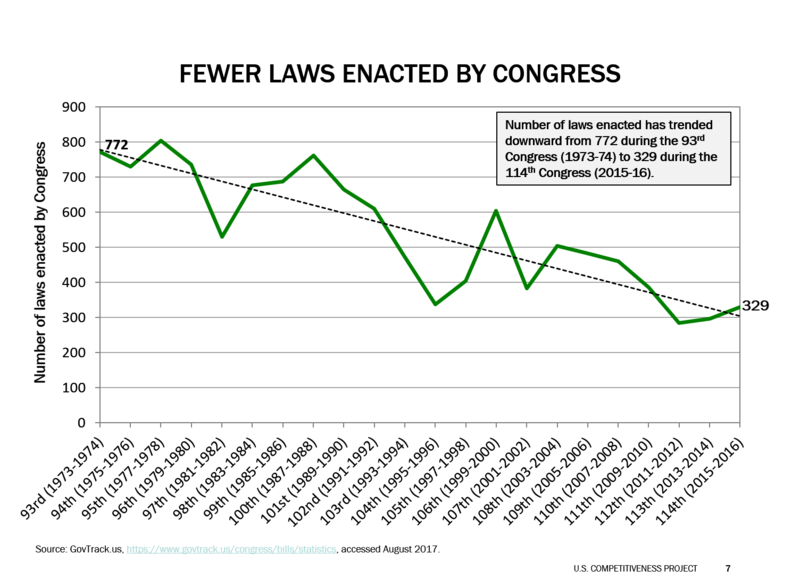 Even in areas where the sides agree, they fail to pass legislation that would represent progress, and instead hold out to deny the other side any victory. Party rhetoric divides voters based on hostility toward the other side. Rather than working to bring citizens together to further the public interest, the duopoly demonizes the other side's supporters and their views. It incites citizens to vote based on anger and fear. The duopoly emphasizes hot-button, divisive issues that appeal to emotion to rally supporters and motivate donors. This approach makes real progress on important issues even harder. It portrays other points of view as illegitimate, and even dangerous. Many Tea Party Republicans, for example, made “no compromises” their mantra. Today, there are strong pressures on Democrats to do the same thing—reject any policy put forward by the Trump administration. In today’s political competition, then, serious legislation can often only be passed when one party forces its bill down the throat of the other party during those rare periods when it has enough power to do so. The results are usually disastrous for the nation (see the sidebar “How Unwillingness to Compromise Fails the Public: The Affordable Care Act”). The Affordable Care Act (often referred to as “Obamacare” or the ACA) was passed by Democrats, including two independents affiliated with Democrats, with no Republican votes. This led to seven years of Republican efforts to repeal the bill, rather than efforts to improve it. After regaining power in the 2016 election, Republicans endeavored to repeal and replace Obamacare, without real engagement with Democrats. So far, their efforts have been unsuccessful. After the failure of an early House bill in March 2017, Speaker Paul Ryan said, “We were a 10-year opposition party, where being against things was easy to do. You just had to be against it.”27 What an admission! Today, almost a decade has gone by since the ACA was passed, and we still lack a realistic and effective health care solution, a vital national priority. Such a destructive, zero-sum pattern of overreach and payback is repeated all too often, resulting in bad outcomes for the nation. 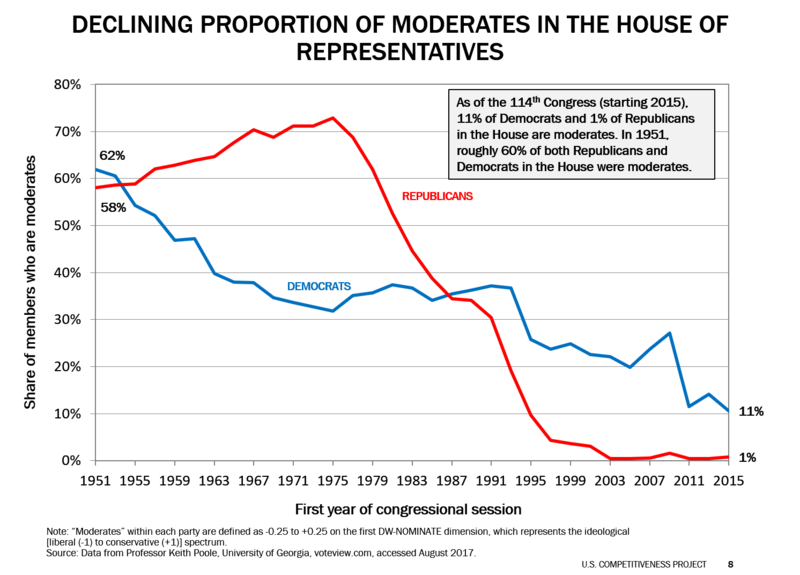 The duopoly has worked over time to set numerous rules and practices to reinforce partisan divisions and enhance party separation. A series of election rules and practices—which both sides have advanced, as we have discussed—have enhanced and expanded partisan division and resulted in more and more extreme candidates and elected officials. Partisan primaries, in which candidates are selected by a relatively small proportion of voters—who tend to be more extreme and politically focused and engaged—push candidates to the left or the right. 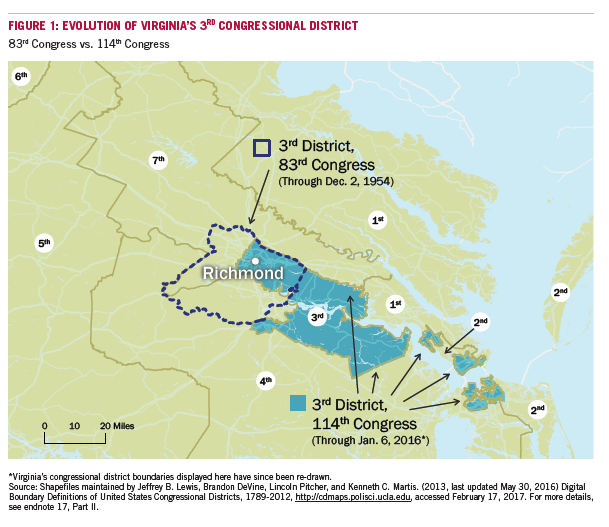 This partisanship is reinforced and amplified by gerrymandered districts that virtually guarantee that one party will always win and, therefore, tend to lead to even more partisan candidates. Sore loser laws, which both parties have advanced, can keep moderate candidates— who cannot win the primary—from running in the general election, as we discussed in Part II. Ballot access rules and fundraising biases invariably disadvantage independents, third-party candidates and often moderates as well. This may even discourage such candidates from entering the race at all. 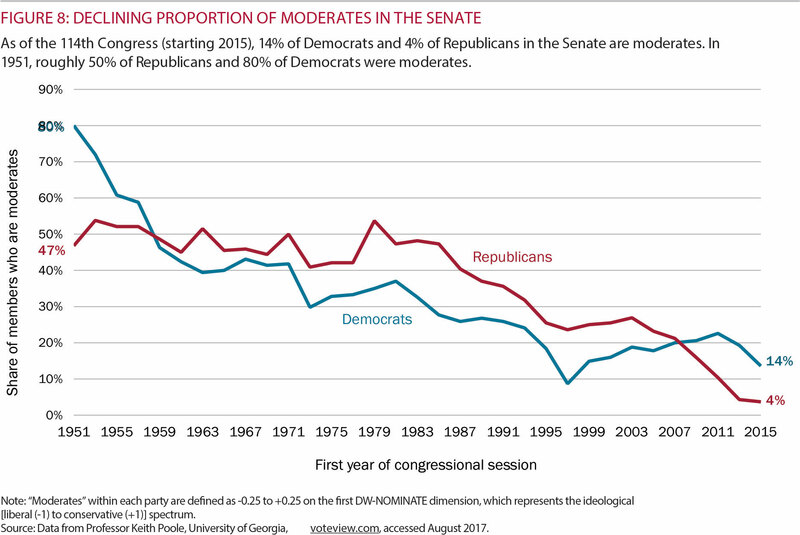 As we have seen, pragmatic moderates in both parties are becoming an endangered species in Congress (see Figures 3 and 4 in Part II). 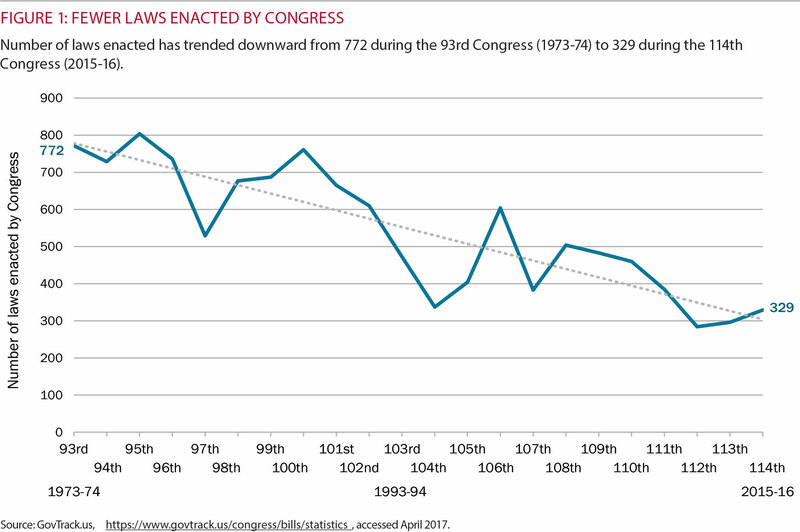 Governing rules and practices have also evolved to amplify partisanship and work against compromise solutions. Party leaders have created powerful levers to reward “loyal soldiers” and to discipline those who stray from ideological purity. Party leaders decide committee assignments and choose committee chairs (positions formerly based on seniority). Legislators who are considered insufficiently loyal can be kept off important committees, limiting their influence. They can also be denied party funding for reelection. has been in secular decline. Leadership discourages bipartisan activity, such as co-sponsorship of legislation or cross-party consultation. 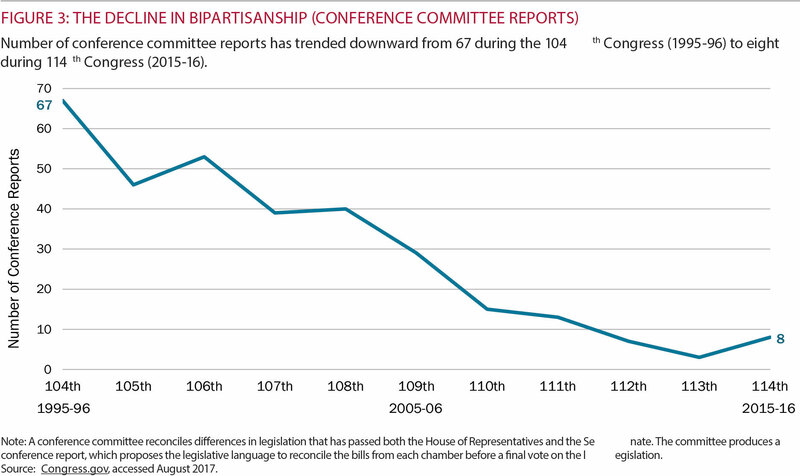 Party leaders have suppressed reconciliation, the process by which bipartisan conference committees reconcile House and Senate legislation. Parties hold separate discussions, often restricted to party leadership. Bipartisan-minded legislators can be marginalized and threatened with a primary challenge in their next election. The very existence of the entrenched duopoly in U.S. politics reflects the very high barriers to entry facing new competition, as we described earlier. The parties have taken major steps to increase and widen the barriers to entry. The election and governing rules and practices we just discussed substantially increase barriers to entry facing new parties and independents. The tight connections forged between parties and the key suppliers needed to contest elections and govern also raise barriers to new competition. So does the growing party alignment with the media and party control of other key channels. The barriers have not only blocked new parties, but also different kinds of competitors, such as independents and even moderates within the parties. As we noted in Part II, the industry’s freedom to set its own rules and competitive practices has tightened its stranglehold over the competition. Rivals cooperate on steps that improve industry growth and influence and protect their collective market power. Barriers to new competition—especially new competitors that compete differently—are essential to sustaining competition that fails to deliver good outcomes for most voters. In the case of politics, a duopoly and barriers to new competition have made the separation and divisive rivalry we experience today almost inevitable. While the parties fail to serve the public interest, they cooperate where they mutually benefit. This cooperation has taken the form of ballot access rules, fundraising rules, debate access rules, and many others we have described. These raise barriers to new types of competition and reinforce today’s partisan competition. The structure of the politics industry, and the nature of the competition that has been created, have failed to serve the public interest and deliver the outcomes most citizens want and need. There are cases where some progress occurs, or individual legislators are able to deliver real solutions in special cases. These are exceptions, not the rule. Despite widespread dissatisfaction with our political system, things are getting worse, not better, as we will discuss in Part V.
The nature of the political competition we observe, and its failure to deliver results for citizens, is not an accident. It is the direct result of the competitive choices the parties have made and the industry structure that the duopoly has created. The abysmal outcomes we are experiencing are the logical result of the nature of competition in this industry. Today’s political competition rewards special interests and partisans, and diminishes the influence of the average voter (much less non-voters). Today’s rivalry incents divisive rhetoric, gridlock, and unfulfilled promises, not solutions. Today’s rivalry undermines the ability to elect pragmatic and moderate public officials, co-opts the independence of the media, and raises ever-higher barriers to entry for third- party candidates, independents, and even moderates. Beyond this failure to deliver good outcomes, the structure of the politics industry has resulted in three devastating implications for the citizens. First, the parties have an incentive not to solve the nation’s problems; second, there is no accountability for results; and third, there are no countervailing forces that will naturally restore healthy competition. In today’s partisan political competition, there is actually an incentive not to solve problems. Keeping a problem or controversy alive and festering is a way to attract and motivate partisan voters, special interests, and committed donors to each side. Neither party, for example, has strong competitive incentives to solve the problem of immigration, because a comprehensive compromise solution would disappoint some of both parties’ most fervent supporters and reliable donors. Additionally, once an issue is “solved,” voters focused on that particular issue may become less motivated to affiliate with and support the party. Most amazing is that despite making little or no progress on solving the nation’s problems and serving the American people, the duopoly is not held accountable for results. Healthy competition involves accountability for results. If rivals fail to deliver the outcomes customers want and need, they lose market share or go out of business. In politics, accountability would mean voting party leaders and many legislators out of office if progress is not made, not just the marginal shifts we have observed in recent decades. In our political system, neither side has real accountability for failing to deliver solutions that advance the public interest. There are only two major parties, who compete by dividing up and serving partisan voters and special interests. This means that voting out individual legislators means replacing them with others from the same party or the other party who can get elected in the current structure. Replacements from either side will perpetuate the current competition or be neutralized if they try to act differently. Frustration votes, then, can shift the balance from one party to the other, but nothing really changes. The parties continue to compete on partisan division, the absence of compromise, and talk, not action. The parties have learned that, to win, they merely need to play the game they have created, not deliver solutions. The parties have made us believe that such competition is normal, and educated us to go along. The duopoly wins. The loser is our democracy. Finally, despite widespread dissatisfaction and delivery of poor results for the average citizen, the duopoly remains dominant, and partisan competition persists. The failure of politics has persisted because the normal checks and balances of healthy competition are neutralized (as they can be in duopolies). In other industries, countervailing forces that make up industry structure would keep competition aligned with the needs of customers. Customers who were poorly served (i.e., the majority of customers in politics) would rebel and look for new kinds of competitors. Powerful channels or suppliers would apply pressure on rivals to serve customers better. And new competitors or substitutes would emerge that met customer needs better. In politics, however, these forces have been co-opted or eliminated. This is because in politics, the normal checks and balances in healthy competition have been neutralized, as we have discussed. What looks like intense competition to the casual observer is not at all what it appears to be. The failed competition in politics is perpetuated most of all by the very high barriers to entry, many of which are artificial and intentionally constructed to deter new competition and substitutes. New competitors could bring new ideas, new solutions, and new ways of serving customers. New competitors could break down the partisan separation by winning over the majority of voters and non- voters who are not as partisan.